Shoppers looking to lease a 2016 Lexus, and looking for the latest Lexus lease specials in Ontario, will want to pay a visit to Lexus of London, the premier destination for all things Lexus in London, Ontario. While there, you’ll see that our lenders finance both new and pre-owned Lexus vehicles for you, and we constantly work to ensure that all the available Lexus specials are applied to your new vehicle loan. Finding all the Lexus lease specials in London that are available to you doesn’t have to be difficult! Our expert team is ready to help you finance a new Lexus in London quickly, easily, and affordably. Looking for the latest in luxury sport sedans? 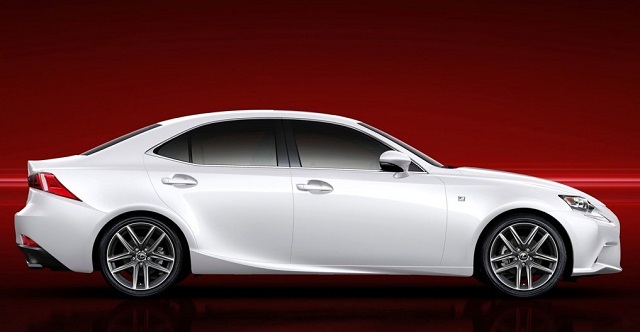 Lease a new Lexus in London for less with the current special on the 2015 Lexus IS 200t Sport. With aggressive styling, track-honed performance and available tech to seamlessly connect to your favorite mobile apps, the Lexus IS is poised to please, and right now you can lease one for just $399 per month on a lease APR of 0.9%. The all-new generation of the RX has arrived at Lexus of London, and thanks to our Lexus lease specials in Ontario you can get into the year’s most anticipated crossover SUV for less than ever. Right now lease a new Lexus RX in London for just 3.5% for 39 months with a monthly payment of just $799. That’s value that will carry you through many winters and summers to come. Schedule your Service Visit at our Lexus Service Centre in Ontario Today – Contact us Online or call (888) 608-9084 and leave independent tire & service centres behind. Shopping for the best deal on a used Lexus in Windsor? Tired of searching high and low for used cars in London Ontario and coming up just short? Let Lexus of London make your shopping trip easier! At our car dealership in London Ontario, our used Lexus specials include a Feature of the Week – spotlight Lexus specials each week which guide you to the best prices on a used Lexus in Windsor you’ll find, and puts you behind the wheel of a like-new used Lexus in London. How do you take advantage of our great feature of the week deals? It’s easy! Just visit our used Lexus specials page, find the used Lexus specials that work for you, and contact us to arrange a test drive! 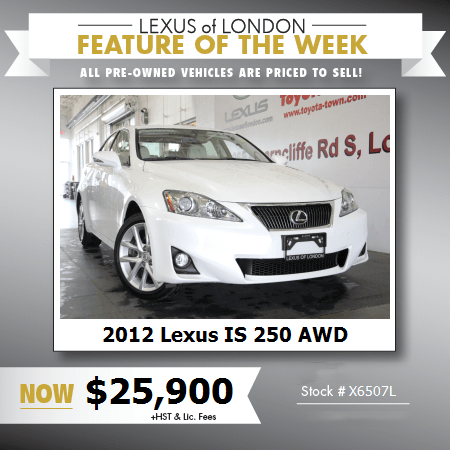 With aggressive styling, track-honed performance and available tech to seamlessly connect to your favorite mobile apps, this 2014 Lexus IS 250 in London is one of the most popular models we sell here at Lexus of London, and right now it’s our feature of the week! Right now at Lexus of London you can get behind the wheel of this 2011 IS for just $22,900, or a 2012 Lexus IS for just $25,900 – but don’t delay, because deals like this won’t last long. For this and other great specials on a used Lexus in Windsor, as well as special offers on many other used cars in London Ontario, keep an eye on our Preowned Specials page. At Lexus of London, we’re proud of our two decade-plus track record of satisfied customers, and of the fact we’re the only Lexus dealer in London where you’ll find New, Used, Certified, and Executive Demo Lexus cars — allowing you more options than anyone else to drive home your next Lexus for less, today. Ready to learn more about our inventory of Used, Certified, or Executive Demo Lexus vehicles? Contact us online or call us at 1 (888) 691-8453. Shopping for excellent 2014 Lexus Specials? Tired of searching high and low for a used Lexus in Sarnia, Waterloo, or Kitchener and coming up just short? Let Lexus of London make your shopping trip easier! At our car dealership in London Ontario, our used Lexus in Kitchener feature of the week guides you to the best 2014 Lexus Specials you’ll find anywhere in Ontario, and puts you behind the wheel of a like-new 2014 used Lexus in Waterloo with a price tag you won’t beat anywhere. How do you take advantage of our great feature of the week deals? It’s easy! Just visit our used Lexus specials page, find the 2014 Lexus specials that work for you, and contact us to arrange a test drive! 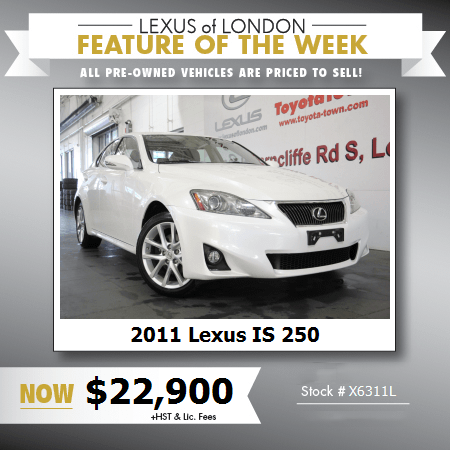 With aggressive styling, track-honed performance and available tech to seamlessly connect to your favorite mobile apps, this 2014 Lexus IS 250 in London is one of the most popular models we sell here at Lexus of London, and right now it’s our feature of the week! 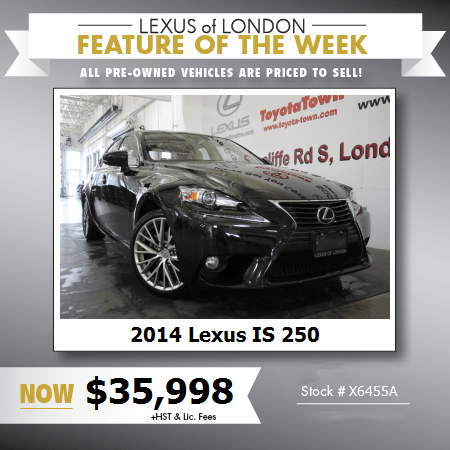 Right now at Lexus of London you can get behind the wheel of this 2014 IS for just $35,998 – but don’t delay, because deals like this won’t last long. For this and other great 2014 Lexus specials, as well as special offers on many other used Lexus in Sarnia, keep an eye on our Preowned Specials page. Ready to learn more about our inventory of new and used Lexus in Sarnia and beyond? Contact us online or call us at 1 (888) 691-8453. If you’re searching for comfort and luxury with the performance to match, check out a used or new 2015 Lexus IS in Ontario at Lexus of London. Why the IS? 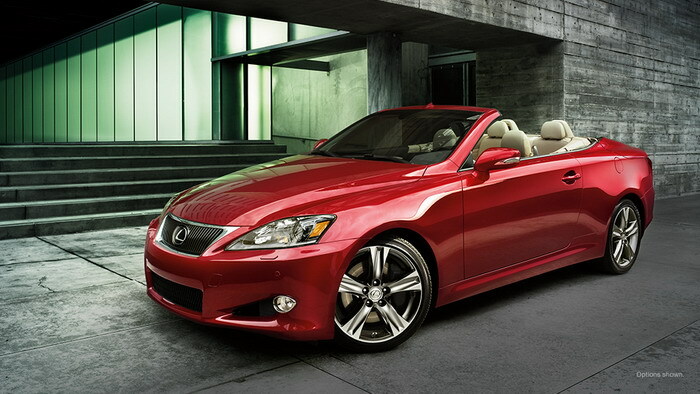 Because when it comes to combining performance with class, nothing compares to a Lexus. 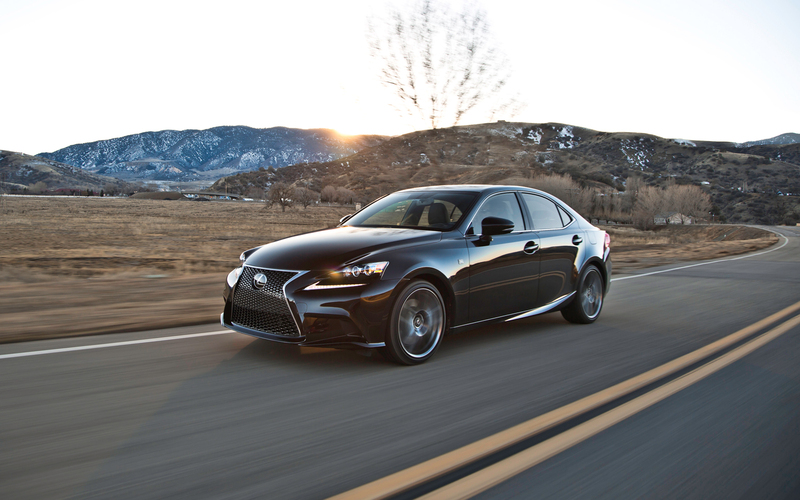 Reviewers love the 2015 Lexus IS in Ontario. US News Rankings and Reviews applauded its “elegant, high quality cabin”, as well as its “sharp steering system”. Car and Driver was impressed by its comfortable seating and interior, as well as its attractive instrument panel. And reviewers across the board have praised its unrivaled safety and all-around quality performance capabilities. 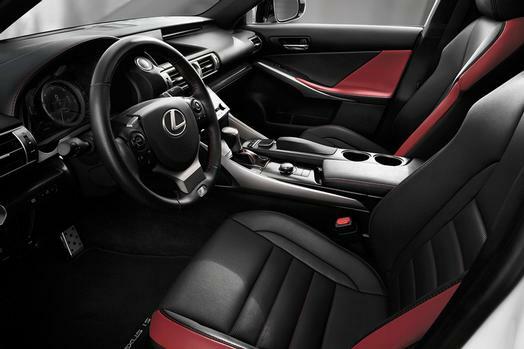 Ready to discover the unparalleled luxury of a used or new 2015 Lexus IS in Kitchener, Ontario for yourself? Then head over to Lexus of London, where you’ll not only find the best selection of the IS, but also Lexus lease specials unlike anything offered by any other dealer in Ontario. Contact Lexus of London online, or call (888) 691-8453 to schedule a test drive of a used or new 2015 Lexus IS in Kitchener, Ontario. Shoppers looking for the latest in luxury sport sedans at a very special price will definitely want to pay Lexus of London a visit and check out the current specials on a new Lexus IS in Ontario. With aggressive styling, track-honed performance and available tech to seamlessly connect to your favorite mobile apps, the new and used Lexus IS in Kitchener is one of the most popular models we sell here at Lexus of London, and right now we have some very special financing offers and Lexus lease specials in Ontario to help you get behind the wheel of the new Lexus IS in Ontario you’ve been looking for for less than ever. The new Lexus IS 250 in Ontario is offered in a pair of trim levels: the base, and the Crafted line. In the base IS 250 you’ll find standard equipment including LED running lights, foglights, and taillights, keyless entry and ignition, dual-zone automatic climate control, an 8-inch infotainment display with voice commands, Bluetooth connectivity, CD player, HD radio, satellite radio, dual iPod/USB inputs, and Siri Eyes Free iPhone integration. 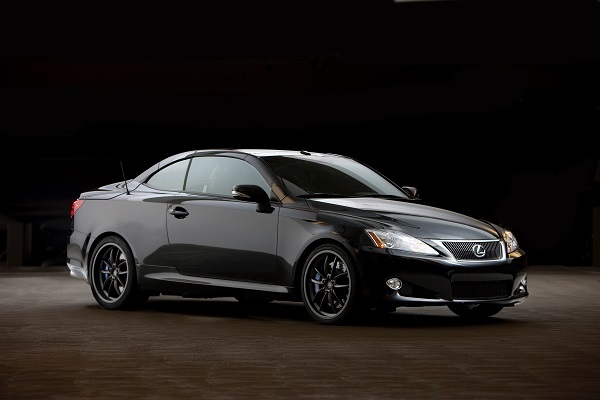 The Crafted Lexus IS 250 adds a sport-tuned suspension, unique paint, a two-tone red and black interior, a two-piece set of Tumi luggage, blind spot monitors, a navigation system, and a host of other options. 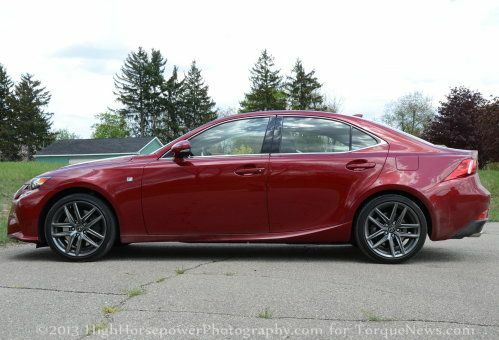 Under the hood, the 2015 Lexus IS 250 in Ontario is powered by a 2.5 liter V6 engine turning out 204 horsepower connected to a six-speed automatic transmission. Right now at Lexus of London you can get behind the wheel of a new Lexus IS in Ontario for just 1.9% APR for 36 months, or choose $2000 cash back on your new Lexus IS in Kitchener. Whether you’re looking for a new or used Lexus IS in Kitchener, our ongoing financing and Lexus lease specials in Ontario will get you into your next Lexus for less than you thought possible, all while experiencing the exceptional customer service at Canada’s #1 Lexus Dealer by DealerRater.com Reviews, Lexus of London. Test Drive a New Lexus IS in Ontario today. Contact us online or call (888) 691-8453 to schedule an appointment at Lexus of London. If you’re searching for a sedan that offers an unmatched level of quality, luxury, and dependability, look no further than the new Lexus IS 250 in London, Ontario. When compared against competitors such as the BMW 3-Series, the Mercedes C-Class, or the Audi A4, Kelly Blue Book found that the new Lexus IS 250c in London, Ontario, has no rival. According to Kelly Blue Book, the new Lexus IS 250c in London, Ontario, offers the most exciting exterior of any IS release yet. 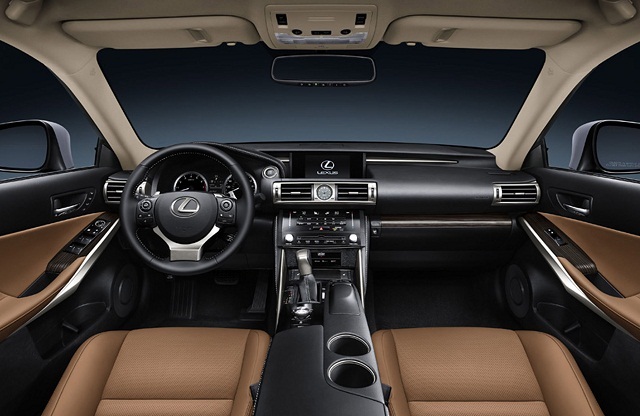 The review also praised the IS 250c for having an interior that is more comfortable, luxurious, and composed of higher-quality materials than competitor sedans. Kelley Blue Book was also impressed by the fact that Lexus offers more features, a better ownership experience, time-tested reliability, and higher resale value than the competition – all at a better price. Are you ready to find out what the reviewers are so excited about? Then head over to Lexus of London in London, Ontario, to test drive a new Lexus IS 250c today. When it comes right down to it, nothing beats a Lexus. Contact Lexus of London online, or call (888) 691-8453 to schedule a test drive of the new Lexus IS 250c in London, Ontario, today. After its introduction last year, Lexus is rolling out some exciting updates for the 2015 Lexus IS 250 in London, Ontario. 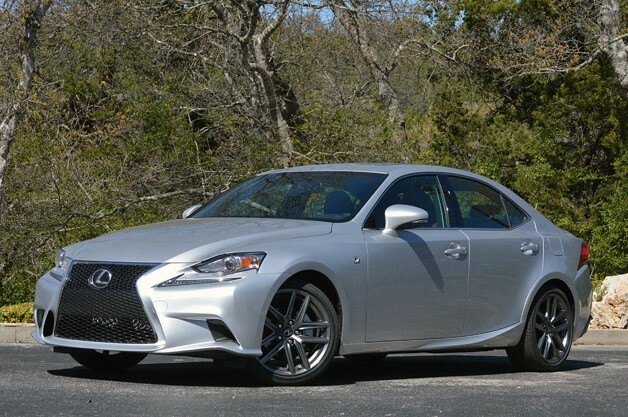 If you’re a fan of this new, sporty flavor luxury sport sedan, you’ll probably want to look into some of the changes being made on the new Lexus IS 250 in London for the 2015 model year. It arrives at Lexus of London this month, so read on for some of the details on the updates, and contact Lexus of London today to learn more. As far as the exterior is concerned, not much is changing on the 2015 IS250 in London aside from the addition of LED fog lights. 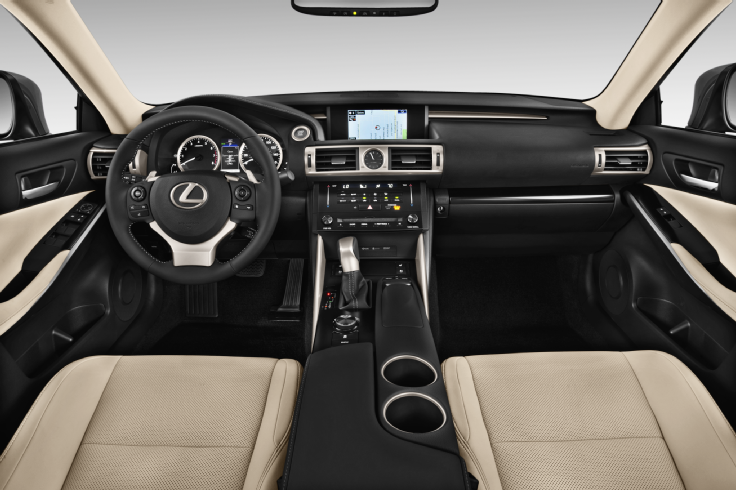 On the interior, the new Lexus IS in London gets Siri eyes-free voice commands for iPhone users, added dynamic gridlines on the standard back-up camera, and a one-year subscription to Lexus Enform Remote, which will allow you to use your smartphone to control certain car functions, such as the door locks. Those who opt for the F-Sport package will find the addition of heated and ventilated seats, and the AWD variant gets a heated steering wheel standard, so you’ll stay comfortable on cool Ontario nights. As Canada’s #1 Lexus Dealer by DealerRater.com reviews, we train our professional staff to be experts on all the latest Lexus goods. So if you’re itching for more details on the 2015 IS 250 in London, or don’t want to miss your chance to test drive the brand new Lexus IS 250 in London this year, contact Lexus of London online or give us a call. Contact us online or call (888) 691-8453 to discover your next Lexus in London, ON, today. With the 2014 Lexus IS250 in London, Lexus gives us a sensible and excellent alternative to the “Big 3” European luxury brands (BMW, Mercedes-Benz, and Audi). 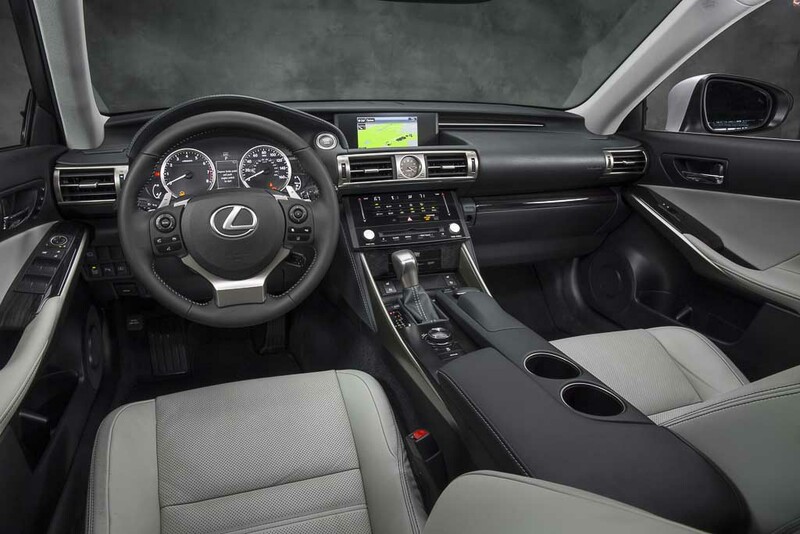 The new 2014 Lexus IS 250 is all-new inside and out – its body style is now wider, longer, and sportier; the interior has been redesigned from the gauges to the seating, and it features an entirely new infotainment system. For more details, check out this video review by AutoByTel. One of the few things remaining unchanged from previous models is the engine – and for good reason. The new 2014 Lexus IS 250 features a powerful 2.5 litre V6 engine turning out 204 horsepower and 185 lb-ft of torque with an exceptionally smooth 6-speed automatic transmission. Drivers looking for the ultimate in sport performance will want to upgrade to the IS 350 or IS F Sport variants, both of which push the envelope even farther with sportier styling and more powerful engine options. Are you ready to explore our vast inventory of new 2014 Lexus IS 250 sedans in London, including the new 2014 Lexus IS 350 and F-Sport variants, with even more driving power? Don’t delay: contact a Lexus of London salesperson now. Our sales personnel are equipped with all the knowledge and expertise required to help you find the new luxury sport sedan in London with the packages and options best-suited for your particular needs. Contact us online or call (888) 691-8453 to schedule an appointment at Lexus of London, Ontario today. The time has come for the release of the new 2015 Lexus IS 250, so let’s take a moment to see what London drivers can expect to change from the 2014 edition. Simply put, if you’re into advanced technology and luxurious comfort, the upgraded 2015 Lexus IS 250 will thrill you even more than the similarly outstanding 2014 release. Externally, the most noticeable change to the 2015 Lexus IS 250 from the 2014 edition is the addition of LED foglights, which not only make for a safer drive, but they also add a sleek aesthetic appeal. Internally there are a number of tech updates, such as an improved radio featuring Siri Eyes Free Voice Command, and a standard backup camera that now features dynamic grid lines for easier use. Those who purchase the F Sport models will enjoy heated and ventilated front seats, and every all-wheel-drive model features a heated steering wheel, which is nothing short of luxurious come winter. 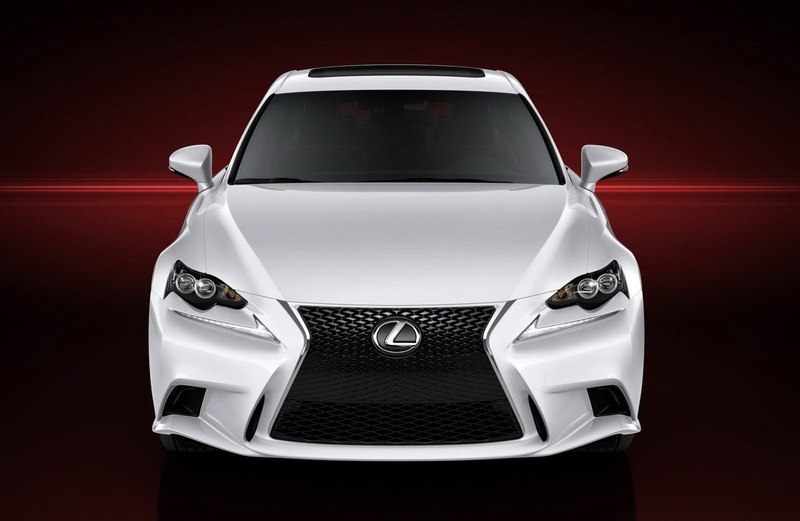 Are you interested in learning more about the differences between the 2014 Lexus IS 250 and the new 2015 version? 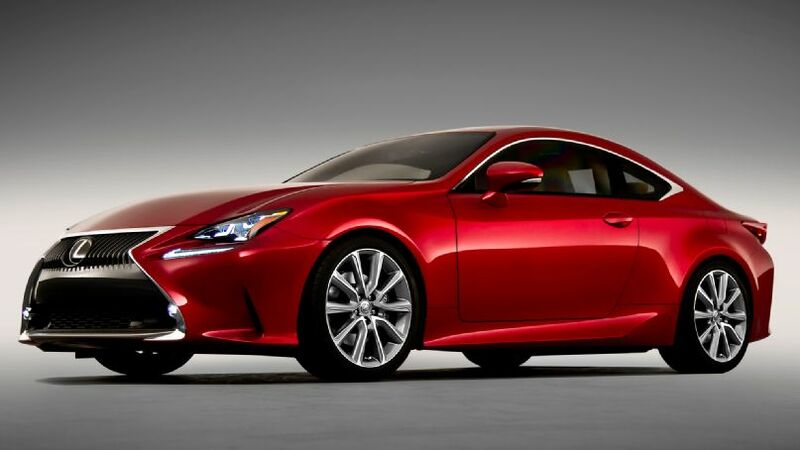 Then head over to Lexus of London, where you can test drive the 2014 and the 2015 Lexus IS 250. Contact Lexus of London online, or call (888) 691-8453 to schedule a test drive of the 2014 Lexus IS 250 in London, and to find out more about the changes to the upcoming 2015 release today. 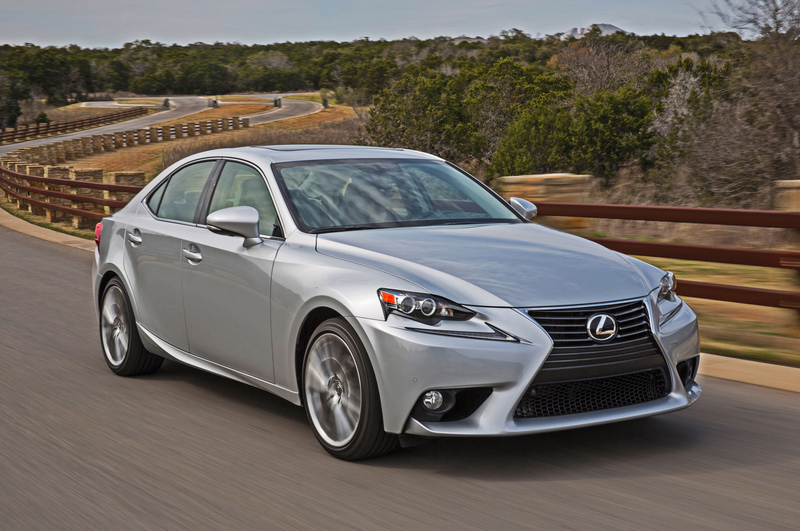 How is the 2014 Lexus IS350c in London Different from the 2014 Lexus IS250c? When it comes to finding a great luxury vehicle, there is no better option than a Lexus, and among the outstanding Lexus lineup is the much-loved IS series. 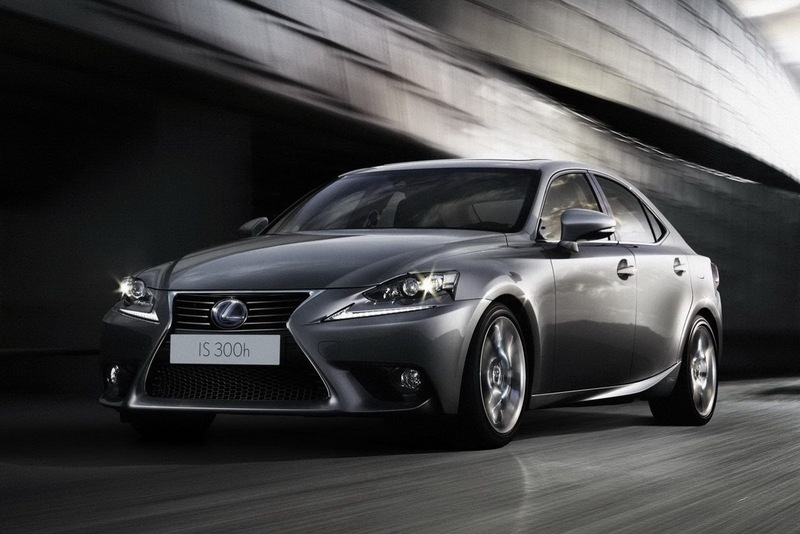 So what are the main differences between the new 2014 Lexus IS350c and the IS 250c in London? Both are great vehicles, but for London drivers who are willing to spend a little more, the difference is made up in terms of power and sporty handling. When it comes to luxury, both the 2014 IS 250c and the 2014 IS350c hit the mark, but when it comes to pure driving power, the new IS350c steps ahead. While the IS 250c offers an adequate 204 horsepower and 185 foot-pounds of torque, the 350 delivers a powerful 306 horsepower and 277 foot-pounds of torque. And while both cars provide a great ride, believe me – you’ll feel the extra horsepower. To find out whether the new 2014 Lexus IS 250c or the 2014 IS 350c near London is right for you, the best way is to compare them with a test drive. Visit Lexus of London today, and we’ll make sure that you learn about all of the differences between these fantastic vehicles. Take a test drive today, and you’ll discover why Lexus and luxury go hand-in-hand. Contact Lexus of London online, or call (888) 691-8453 to schedule a test drive of the new 2014 Lexus IS 250c and the Lexus IS 350c today.